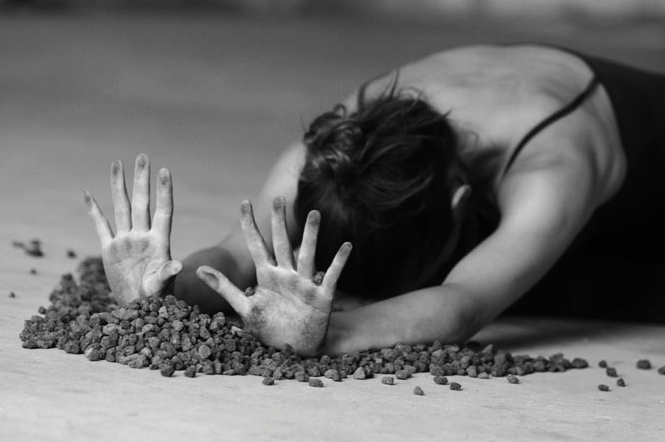 Performance___ __Diana Coelho // Photography _____Eduardo Carvalho & Mariana Mesquita . The whole, the mass of humanity, the pattern of sacrifice and the doing by the sake of doing, ambition, discipline and redistribution. The axiom of “making an Altar of earth”, which looks at the fertile darkness of the land and takes it as an altar when confronted with the built and tinkling power of “humanity”. An action in duration, which sacrifices time in reflection of assignments of power and the streamlining of codes of principles. Altar is a collaboration with the Polish visual artist Nespoon Polska, who created small, white porcelain pieces, for three months, out of waste from her original works and volcanic stone from São Miguel Island (Azores, Portugal). The creation of the performance took place every day in a public space, in front of the theatre house Teatro Micaelense (Ponta Delgada), and the final result was moved to the gallery Walk&Talk, in a subversion of places process-result.